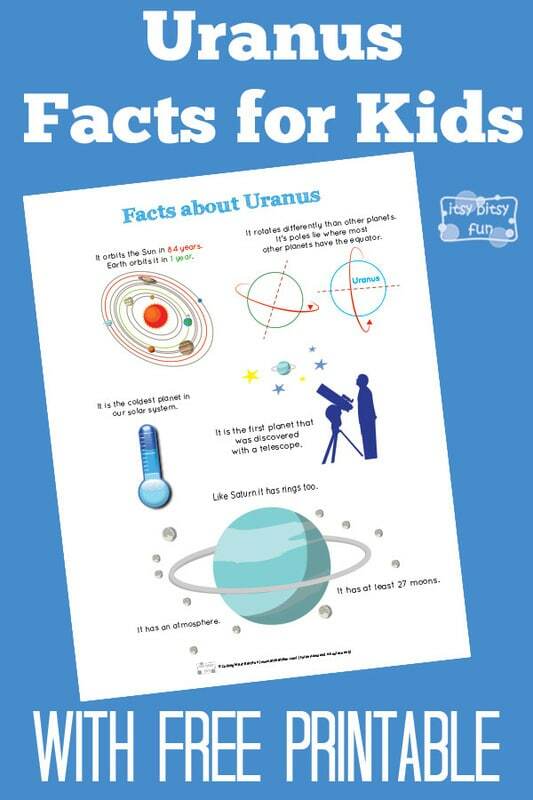 Let’s learn with facts about Uranus for kids! We went through the solar system facts for kids the other day and now it’s time to take a closer look at the planet that was a starting point for too many kid jokes when I was growing up (way to many!). Let’s learn something this awkwardly named planet shall we? Like Saturn this planet has rings too! It orbits the Sun in 84 years. It is the coldest planet in our solar system. It rotates differently than other planets. It’s poles lie where most other planets have the equator. It has at least 27 moons. It is the first planet that was discovered with a telescope. Get free printable PDF with Uranus Facts here.